Place biscuits in greased muffin cups, pressing dough onto the bottom and up the sides. Add 1 tablespoon cheese and cereal to each cup. 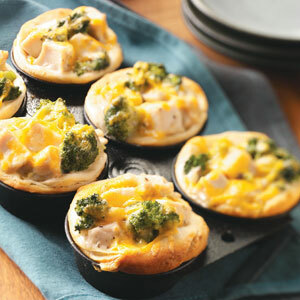 In a large bowl, combine the chicken, soup and broccoli; spoon into each muffin cup. Bake at 375° for 20-25 minutes or until bubbly. Sprinkle with remaining cheese. Yield: 10-12 servings.